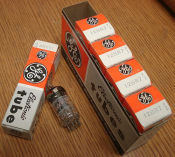 Sorry, we are currently sold out of '12BA6 / HF93 Tube ( UT ) Delco'. Please check back later as we are constantly restocking empty bins as fast as we can to keep up with demand. Sorry, we are currently sold out of 'HK90 / 12BE6 Tube ( UT ) Mullard'. Please check back later as we are constantly restocking empty bins as fast as we can to keep up with demand. Sorry, we are currently sold out of 'HK90 Tube ------------- CROSS REFERENCE ----- 12BE6 Tube'. Please check back later as we are constantly restocking empty bins as fast as we can to keep up with demand. Sorry, we are currently sold out of '12BQ6 ------- Cross Reference ------- 12CU6'. Please check back later as we are constantly restocking empty bins as fast as we can to keep up with demand.